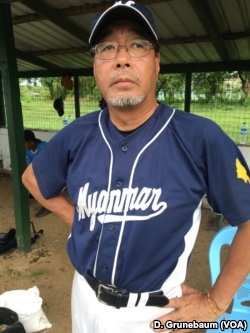 Kyaw Thuya Tun, a taxi driver, plays first base for the Myanmar National Team and Coach Iwasaki. YANGON, MYANMAR　（June 17, 2018 VOA） — No member of the Myanmar national baseball team is quitting their day job any time soon. Made up of players in their 20s, 30s and 40s, the club includes maintenance workers, a teacher, as well as a cook. The coach, Toru Iwasaki, is the founder of a private primary school in Myanmar’s largest city, Yangon. He is originally from Japan and started the baseball program 18 years ago. “Of course in Myanmar, football [soccer] is the most popular sport,” Iwasaki said. “My passion is to introduce baseball, which is my most favorite sport.”　The team gets very little financial support from the national sports ministry and depends upon money from Iwasaki’s own pocket to stay afloat. You won’t find baseball bats, balls and gloves on the shelves of sporting good stores in this country. Most of the team’s equipment has been donated by the Japan High School Baseball Federation. Many of the players Iwasaki recruited had experience playing in softball games organized by the American Embassy. So while they understood some basic rules, Iwasaki had to explain to them a lot of the mechanics and necessary skills. He also taught them about strategy and field positioning. Iwasaki knows a little Burmese and his players have picked up some English as well as Japanese. Between the mix of languages and Iwasaki’s hand gestures he gets his messages across. “Sometimes all it takes is the happy or angry tone of voice to make my point,” he said with a grin. Kyaw Thuya Tun, 33, is the team’s first baseman. He drives a taxi to support his wife and two daughters. “I drive the car to work for my family and I play baseball because I love it,” he said. The team plays on the site of an old horse race track. The field is a combination of weeds, overgrown grass and hardened dirt, or mud depending upon the weather. The scoreboard is changed by hand. 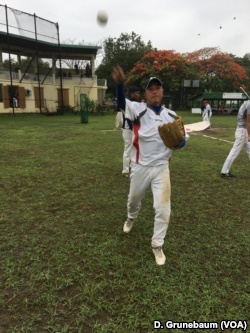 On a cloudy afternoon with intermittent rain, the Myanmar national team narrowly beat a rag-tag squad of expatriates from the U.S. and Japan by a score of 7 to 6. It’s one of several games the Myanmar team played this year against teams made up of local expatriates. “I like coming out with the guys and the camaraderie that comes out of it,” said Mick Amundson-Geisel, who played first base for the expatriate team. He’s 46 years old and played high school baseball in Colorado. Amundson-Geisel now works as a guidance counselor at an international school in Yangon. On this day, he’s competing against the Myanmar team. On other days he practices with them. “It’s definitely an American game, but it certainly has Asian aspects here like the language that they use and the cheers that they do,” Amundson-Geisel said. But you get a sense of how little is known about baseball in Myanmar when you notice there are only about 25 people in the stands during the game. The team prepared a printout in the local Burmese language with some of the basics of the sport to help fans follow along. Few people understand baseball in this country where football/soccer is king. The Myanmar national team couldn’t beat most American high school baseball teams. But watching the squad in practice and compete in a game, it’s clear there’s no shortage of enthusiasm. The players say they love the sport and will keep swinging away.